The roadway bridge over Tisa River is designed as a cable stayed bridge with spans 2×25.8 + 90.3 +4×25.8m having a single A-shaped pylon. 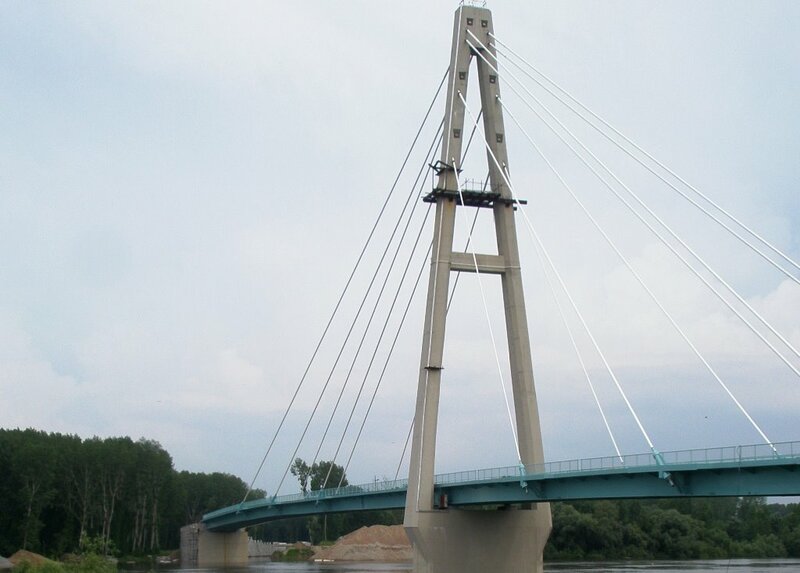 The dismantled steel bridge structure from old bridge in Wilshoffen (Germany) is incorporated in new bridge over Tisa River at Ada (Serbia). The main span of new bridge (90.3m) is formed by connecting the former main span (64.5m) with side span (35.8m). The piers and abutments are founded on the sets of bored piles Ø1200mm. The foundation of the oilers, placed at the navigation route, were is constructed by means of cofferdams with pile sheets (double walls of sheeting). Construction is performed by INTERMOST company.